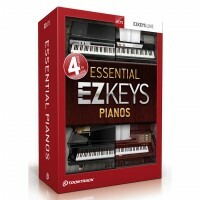 This bundle combines the revolutionary Toontrack EZkeys software with three products from the EZkeys Line. Included are four equally iconic and essential instruments for any studio´s or songwriterÂ´s toolbox; the timeless grand piano, the intimate upright as well as two of the worlds most defining and characteristic electric pianos, the Rhodes MK I and the Wurlitzer 200. The Essential Pianos bundle has the sounds you need for anything from epic classical compositions and intimate jazz sessions to rock, pop and soul. EZkeys comes with an extensive MIDI library (over 700 MIDI files) performed by a professional session pianist. EZkeys Grand Piano comes with a Steinway and Sons model D grand piano, sampled to perfection in a world-class recording studio using only the best of the best in vintage and modern recording gear. The model D grand piano is the undisputed industry standard among performers and producers worldwide and has over the past century and half had an overwhelming amount of musical history and heritage created on it. The EZkeys Upright sound library is a carefully sampled –stlind & Almquist piano. This classic and award winning Swedish brand dates back to late 1800s and delivers a characteristic, rich and warm tone unlike any other instrument of its kind. It was sampled in painstaking detail at a world-class studio using only the best of the best in modern and vintage recording equipment. EZkeys Classic Electrics comes with two of the world´s most defining and characteristic electric pianos, the Rhodes MK I and the Wurlitzer 200. These instruments have been the voice of several generations and immortalized in classic songs spanning any genre from funk to soul and jazz. Captured in painstaking detail by top of the line equipment, the Classic Electrics libraries combine second-to-none playability with world-class sounds, making them just as perfect for the stage as the studio.